Add the onion and cook, stirring occasionally, until the onions are soft, about five minutes. Add the spinach and cook, stirring occasionally, until the spinach is wilted, about two minutes more. Add the garlic and cook, stirring constantly, for 30 seconds. 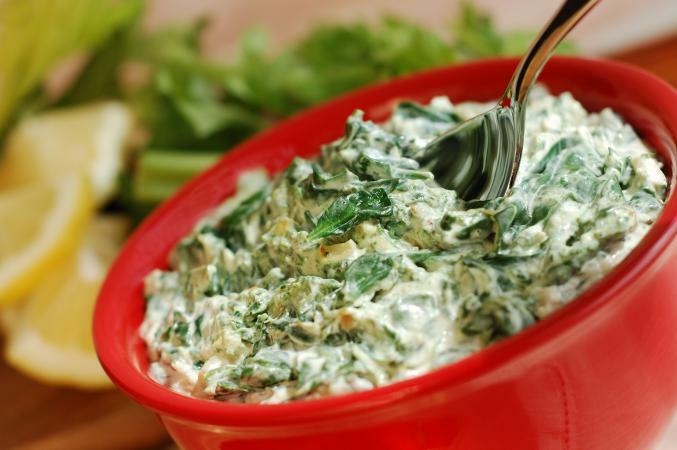 In a food processor, combine the onion and spinach mixture with the artichokes, mayonnaise, cream cheese, Tabasco, salt and cheese. Pulse for 10 to 20 one-second pulses until well combined. Spread in an 8-inch square baking dish. Bake, uncovered, in the preheated oven for 25 to 30 minutes, until the dip is bubbly. Serve hot with the tortilla or pita chips for dipping. Add some acid by including the grated zest of one lemon when you add everything to the food processor. Omit the onions, oil and fresh spinach. Instead, skip the cooking and use 2 cups of frozen spinach, thawed and drained, adding it to the food processor with the remaining ingredients. Continue the recipe as written. Add 8 ounces of sliced mushrooms, cooking them with the onions.